Guess what is on the design wall . . . my “Scrappy Squares” leader/ender project. To see the beginning of this project, click here. My plan was to make a quilt with a 7 x 7 grid, i.e. 49 blocks. Sewing squares together in between other projects, I made 25 blocks. The centers were cut 3 1/2″ square and were surrounded by 2″ squares. Once I completed these 25 blocks, I placed them on my design wall. If blocks are on the wall rather than in a box, they are more likely to become a quilt. Seeing them is motivation to work on the project! I chose a simple design for alternate blocks that utilizes Four Patches leftover from my “Confetti” quilt. Click here and here to see the “Confetti” quilt. The colorful squares were cut 2″ x 2″ and the white strips were cut 2″ x 3 1/2″ and 2″ x 6 1/2.” Here’s a close-up of a section of my “Scrappy Squares” lap quilt. 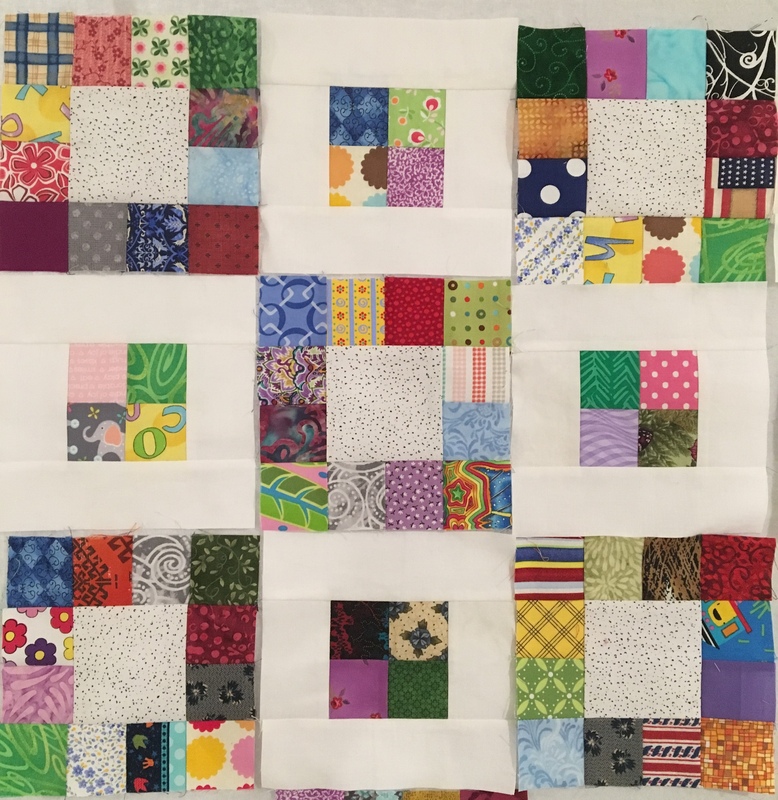 It is so exciting to see “Scrappy Squares” coming together. 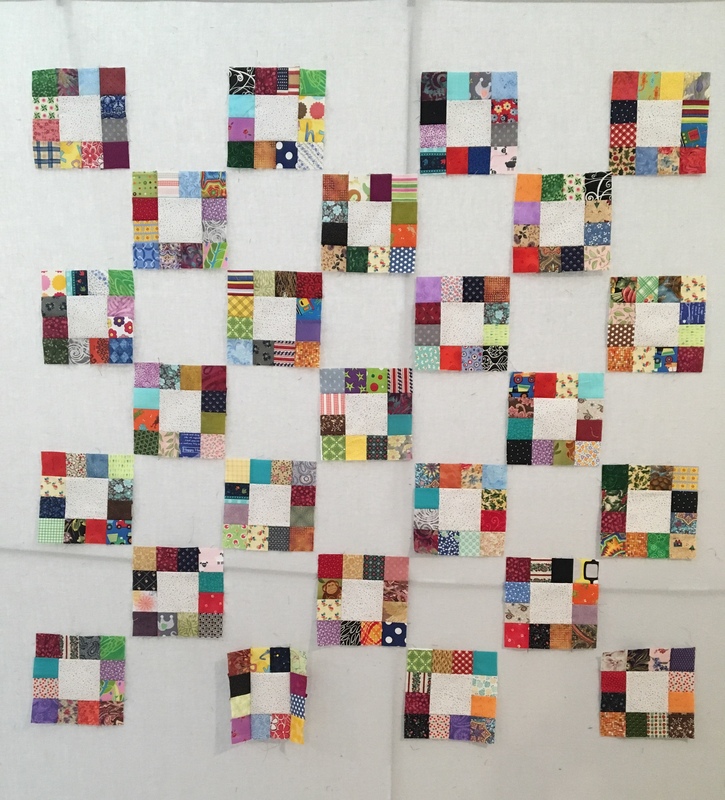 I might be tempted to complete the alternate blocks in one sewing session rather than piecemeal as leaders/enders. What motivates you to finish a long-term project? I can see this being a very fun and fabulous use for all those 60’s VFG fabrics!!! Love this! I have a shoe box full of 2 1/2″ squares so will have to redo some of the math but I’m fine with that. My motivation comes from my quilt group. I want to show progress on my project to keep other quilters plugging along on their projects. I’ve been told often that seeing my finished projects encourages someone to get theirs finished. Mom this would look super sharp set on point with a piano key border all the way around.